Discrete event simulation software provides an effective way for receiving system characteristic in cases when it cannot be obtained with analytics, i.e. when exact formula either is not exist or its сomputational complexity does not allow to receive the result in a reasonable time. Simulation modeling software based on discrete event approach may be used in many branches: network simulation, traffic simulation, industrial simulation, can be applied for engineering purposes, for science and education. OpenSIMPLY as a science software for researching of complex systems. 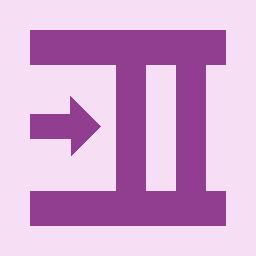 But the ideology of the project is suitable for people of any experience as in programming as well in simulation. The source code of OpenSIMPLY is compatible with the syntax of Object Pascal compilers like Delphi and Free Pascal (including Lazarus), and can be changed from application level down to kernel. OpenSIMPLY offers two styles of simulation. This approach requires from the user minimum knowledge about the functionality of discrete event simulation. The user should only to connect required simulation blocks and assign the parameters. Each block is a complete item for modeling. 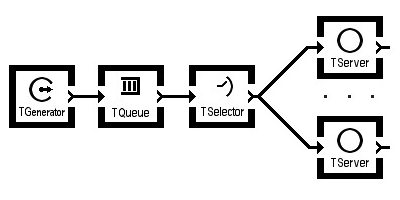 In this example the block "TGenerator" represents the source of entity stream , the block "TQueue" represents the waiting line, the block "TServer" represents the time delaying object, and so on. User can add its own extensions: distribution laws, selection rules, functions. User can create its own block that is not present yet. User can modify existing blocks, all of them are fully extandable in parameters and functionality. Appreciate the simplicity of block simulation with OpenSIMPLY using simulation examples of Queueing Theory. The learning videos will help to understand some aspects of discrete event simulation. OpenSIMPLY tutorial contains practical examples with detailed description. All of them are ready to compile. Simulate now! Simula-like simulation approach is very similar to Simula programming language ideology. This style is an advanced one. It provides low level simulation technique where user can implement any featuers of the system to be simulated. Here coder has real freedom in the description of the model behavior. The activation and suspension of the processes is a keyword for this simulation style. The models created with this approach are running much faster than block-simulation models. Even the model in Simula with some adaptation can be used with OpenSIMPLY.